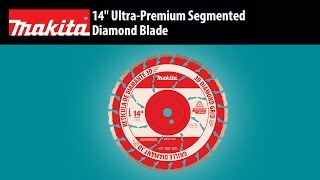 The Makita 14" Ultra-Premium Segmented Diamond Blade is the new standard in diamond blades. The blade features unique "M" shaped segments that are laser welded to the blade. Each segment is scrutinized under quality control to exacting standards. The 3D Diamond Grid means the diamonds are arranged in a precise 3 dimensional arrangement for optimal cutting speed, reduced noise, lower vibration, and longer blade life. Noise and vibration reduction technology is built into every blade by utilizing laminated plates for reduced vibration and noise. These versatile blades will cut through a variety of materials including concrete, asphalt and granite. Shipping Weight : 4.25 lbs.